HAUPPAUGE, NY--(Marketwired - Feb 18, 2015) - Long Island, NY is spreading the word that just because it's often considered a summer and fall travel destination, this Island doesn't hibernate during the colder months. 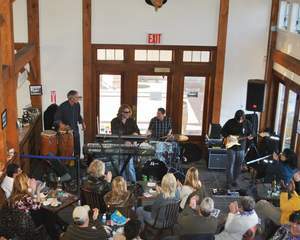 In fact, things are heating up with a fantastic six-weekend-long music festival held at various East End wineries during the Eighth Annual Winterfest - Live On The Vine. Long Island Winterfest, an 'Americans for the Arts' award-winning festival, takes place each weekend from February 21 through March 29, 2015 and includes more than 70 concerts in vineyard tasting rooms, boutique hotels, craft breweries and historic theaters. More than 50 emerging artists and headliners present a diverse menu of musical styles: jazz, rock, bluegrass, classical, world, singer-songwriter and more, amidst the backdrop of one of the most charming regions in NY. Some of the finest music in the Northeast will descend upon the North, including emerging artists and national headliners for every taste and in every genre. Jazz guitarist Stanley Jordan, rockers the Smithereens and 10,000 Maniacs, the legendary Roomful of Blues, jazz trombonist and Downbeat Magazine award winner Ray Anderson, Americana sweetheart Amy Helm, and Paul Simon Bassist Bakithi Kumalo are just some of the artists appearing this year, with many more being added. Conceived in 2006 by East End Arts (EEA), Long Island Wine Council (LIWC) and Long Island Convention and Visitors Bureau (LICVB) with support from Suffolk County, Winterfest - Live On The Vine was created to promote musicians' work and bring tourists to the region during the winter months. In 2012 it was awarded the "National Destination Marketing Award" by Americans for The Arts and Destination Marketing International.